Grainger Public Relations » Dundee Science Festival Has Designs on Past & Future! Dundee Science Festival Has Designs on Past & Future! Dundee Science Festival will embrace all things digital this weekend, with designs on the past and the future. 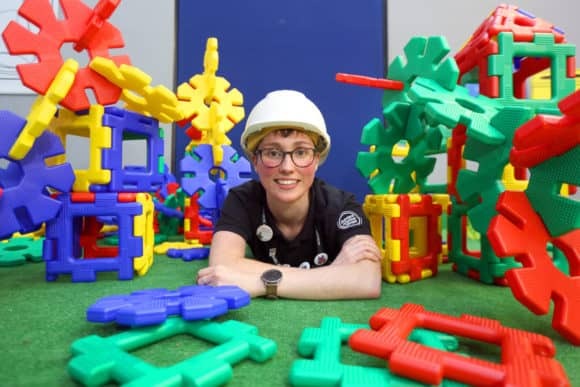 Dundee Science Centre’s Emma Dixon preparing for the fun weekend! Credit – D C Thomson. As the weekend approaches, travel on a ‘Science Adventure’ to Ardler Complex on Friday 10 November where, from 4 until 8pm, a free, drop-in event will invite visitors to take part in a host of challenges and activities. This family friendly event will showcase everything from how our bodies work and how stress affects us, to the huge array of careers related to Science, Technology, Engineering and Mathematics (STEM). Meanwhile, a host of local experts will be ‘Designing Tomorrow’s World’ on Sunday 12 November. Where are we going and what will it take to get us there? What have we learned from looking at the past, while moving into the future? With the chance to take part in a range of activities, including a purse making and weaving workshop using recycled plastic from Dundee Science Festival banners, find out how digital technology is propelling us into the future in areas such as medicine, gaming, engineering and more!